In this rare, live, interactive event, the Bering Sea’s toughest crew swap stories as they take the audience through some of the roughest situations the captain and crew have ever had to face on the high seas. From the treacherous weather and crew conflicts, to the triumphs of the team, Captain Sig along with Johnathan and Andy Hillstrand bring the intimate world of crab fishing to a live audience. “Deadliest Catch” was released to the public in 2005 and has been going strong ever since, making it one of the most popular shows in Discovery Channel history. 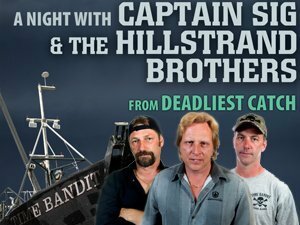 For the first time, fans across the country have a chance to hear the stories behind the show, view never before seen video, and partake in a question and answer session with members of the cast of “Deadliest Catch.” Season seven will debut April 12th.